Its large visor on the front characterizes the new Parabellum just as the entanglement of the two shells clearly visible at the rear. It has excellent head coverage for such a featherweight. 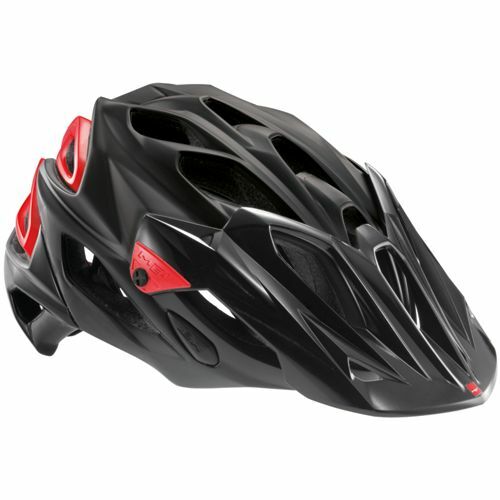 It is without a doubt the best all-mountain helmet. Product category : MTB all mountain. Sizes : M 54 – 57cm ; L 58 – 61cm. Weight : M 235 g, L 250 g.
In-mould construction involves fusing together in the same matrix the two parts of the helmet shell (the interior which is generally black or grey polystyrene and the coloured polycarbonate exterior) during the moulding process. Thanks to the In-mould Intelligent Fusion process, MET goes even further by using different densities of material depending on the characteristics of each model to improve the weight/volume ratio while optimising the shock absorption capacity. dissipates the force of impact over the whole shell. This exceptional design and a manufacturing technique, that today only MET has mastered, makes the HES concept a new reference in cycle helmet construction. Adjustable visor with integrated air intake vents. The visor’s role is to protect the face and especially the eyes from branches, sun or, in bad weather, against mud flicked up by bikes in front. When the visor has air vents it actively helps cool the head by directing the air towards the inside of the helmet. The tilt of the visor can be adjusted by loosening anodised aluminium side screws. This allows you to fine tune your field of view. Note that at the highest position the visor leaves enough space for your goggles strap in 'rest' position. Gel 02 anti-allergenic front pad. Instead of absorbing perspiration it sends it towards the sides of the face. With superior hygiene, a much longer lifespan, a natural capacity to adapt to body shape, its thickness remaining stable over time... the GEL O2 front pad offers so many advantages that it will permanently change your idea of helmet comfort. Originating from the medical industry, it is hypo-allergenic, anti-bacterial, made from thermo-stabilising polyurethane morpho-gel, and it helps keeps the head really cool, a key factor not only for comfort but also for the cyclist’s performance. Exclusive technology developed by engineers in our Research and Development laboratory. Occipital retention system. Its role is to ensure that the helmet is held firmly on the head. A dial at the back of the helmet for easy one-hand size adjustment. The internal mechanism was designed for precision and reliability. The Safe-T Smart also includes a vertical adjustment to position precisely where the helmet touches the head. Thanks to the broader and lighter contact area, the pressure on the head is distributed in a homogenous way for added comfort. Now anyone can film themselves while riding. And to help you we have designed the MOPOV (My Own Point Of View) kit which allows you to fit your onboard camera onto your helmet in a flash. Removable kit fitted to the centre of helmet. An Allen key is all you need to fit the kit. Light weight. System suitable for multi-brands. the MOPOV and not to the helmet itself. The straps on the new Stradivarius are made from a revolutionary technique of weaving polyester fibres which aids sweat evaporation and provides greater tensile strength with less weight. Air Lite lateral dividers go way beyond their primary function which is to lock the straps into position. Indeed, their ultra-flat design helps reduce aerodynamic drag. Being visible is essential to the safety of a cyclist. At night or in tunnels, the reflective sticker placed at the back of the helmet makes the bike visible to drivers approaching from behind.